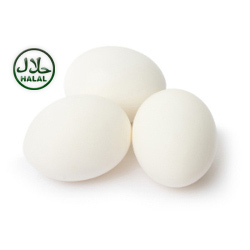 Our range of products include Chicken Eggs such as Chicken White Eggs and Chicken Brown Eggs.We provide high quality "HALAL" Certified Eggs.Chicken eggs are widely used in many types of dishes, both sweet and savory, including many baked goods. Some of the most common preparation methods include scrambled, fried, hard-boiled, soft-boiled, omelets and pickled. Load-ability in a 40 feet Reefer Container. 30 Eggs laid in a a pulp and pack tray. 12 such trains trays in a carton ( 360 Eggs ). 1312 Cartons or 1148 Cartons in a 40 feet Reefer Container.